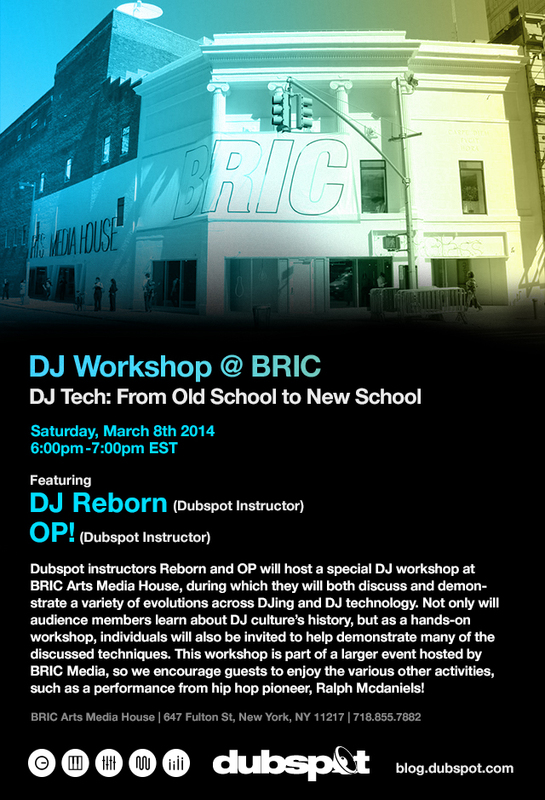 On Saturday March 8th, Dubspot will host a DJ Workshop at the BRIC Arts Media House in Brooklyn with DJs Reborn and OP! demonstrating the evolution of DJing and DJ technology. On Saturday March 8, 2014 from 6pm – 7pm, Dubspot will host a special DJ workshop at BRIC Arts Media House featuring instructors Reborn and OP, who will be discussing and demonstrating the evolution of DJing and DJ technology. This workshop will include an interactive element where audience members will be invited to help demonstrate topics discussed. Learn about the history DJing and get insight into some of the new technology available. This workshop is hosted as part of a larger event by BRIC Media so we invite guests to enjoy other activities that day including a performance from hip hop pioneer Ralph Mcdaniels and more! In the 35 years since its founding as a not-for-profit organization in 1979, BRIC has been the driving force behind a number of Brooklyn’s most widely renowned and beloved arts and media programs. In the borough that is now this country’s foremost creative hotbed, BRIC is unparalleled in its combination of artistic excellence, programmatic breadth and genuine accessibility. BRIC presents live music and performing arts (the Celebrate Brooklyn! Performing Arts Festivaland BRIClab), contemporary art exhibitions and programs (until 2013 at BRIC Rotunda Gallery and throughout the borough), and community media programs (Brooklyn Free Speech TV,Brooklyn Independent Media, and Brooklyn Bulletin Board) that reflect Brooklyn’s creativity and diversity. Emphasizing creative expression as varied and groundbreaking as the borough it serves, BRIC provides opportunities and platforms for Brooklyn artists and media makers to create and present new works. The organization champions the creativity of Brooklyn and work that expands the boundaries of artistic disciplines. BRIC’s highly accessible exhibitions, performances, television programs and educational programs serve more than one million Brooklyn residents, including some 4,000 school children, each year. « Dubspot LA’s 2nd Wave of Teachers Announced! Mark de Clive-Lowe, Jeremy Ellis, James Bernard, and Emch Subatomic!